Bhubaneswar, Aug 18: Former champions Kalinga Institute of Social Sciences (KISS) and Mother’s Public School started respective group league campaigns on winning note in the MCL Cup 29th Bhubaneswar Inter-School Football Tournament here at Unit-VI Boys’ High School Ground today. A goal each by Ganesh Murmu and Sushant Tudu helped KISS get the better of Bibekananda High School by 2-0 goals in Group G. Ganesh gave them the lead early in the eighth minute, while Sushant netted the second goal in the 48th minute. However, Bibekananda custodian Dibyajyoti Pradhan, who saved at least six goals, was declared the player of the match. He received the prize from Hockey Olympian Lazrus Barla, who appreciated the role of Unit-VI Athletic Association in promoting football at the grassroots level. Earlier in the day, Mother’s Public School faced stiff fight against DAV School, Chandrasekharpur before winning their Group-H match by 1-0 goal. 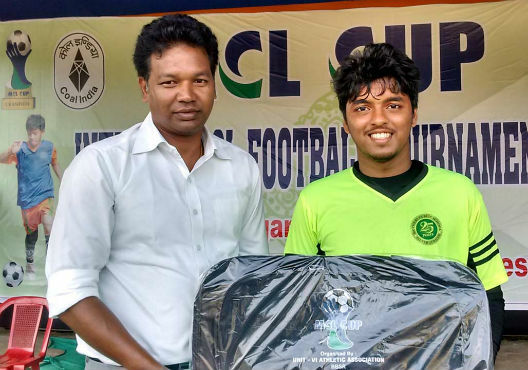 Sarthak Sarangi scored the all-important goal in the 45th minute to be adjudged the player of the match. He received the prize from Bhubaneswar Athletic Association joint-secretary Naba Ranjan Patnaik. Today’s matches were officiated by match commissioner Maheswar Singh along with referees Saroj Moharana, Sekhawat Khan, Rajendra Barik, Amit Nayak, Asirbad Kanungo and Bulbul Bhoi.